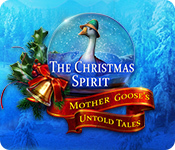 December 18th, 2009 by Big Fish Games in Walkthroughs. 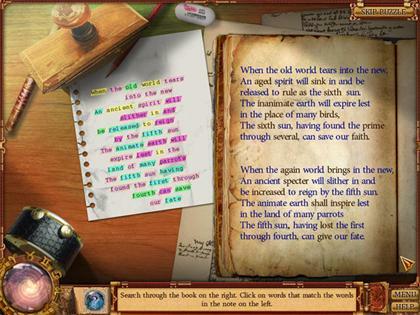 Welcome to the Cassandra’s Journey 2: The Fifth Sun of Nostradamus Walkthrough! Cassandra finally has her magic ring back. 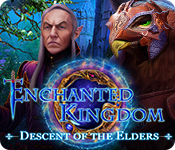 But instead of putting the mystery of Michael’s disappearance to rest, the ring has spawned a new and dangerous adventure! 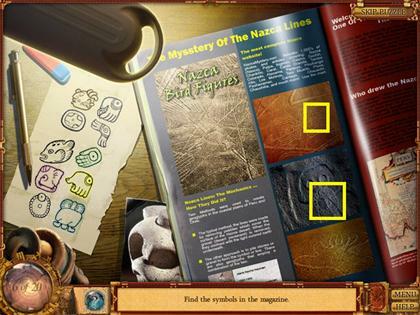 Please enjoy our complete Cassandra’s Journey 2: The Fifth Sun of Nostradamus game walkthrough with annotated screenshots from actual gameplay! This walkthrough created by prpldva. Adjust the audio and video settings in the options menu. 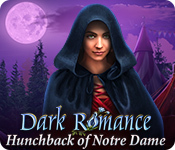 You may play this game in windowed or full-screen mode. This program does support wide-screen monitors. 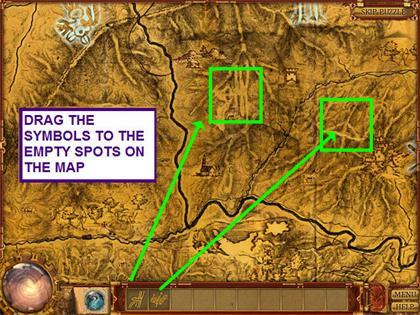 You may disable custom cursors and effects for slower computers. Clicking on the “Welcome” sign takes you to profile management. 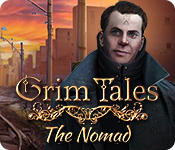 Once you have configured your profile, click on “Play” in the crystal ball to play. 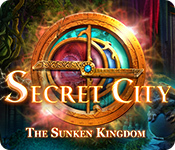 Under the “Play” button is the link to the Fortune Telling Room. 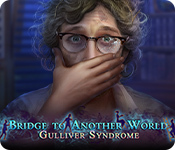 There are 4 versions of solitaire that become available once you have completed them inside the game. 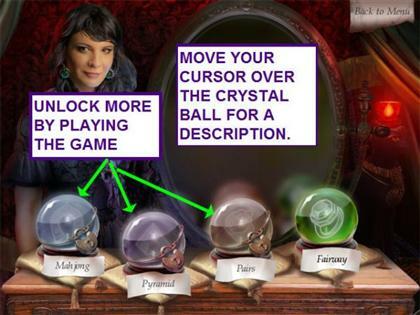 Move your cursor over the crystal ball for a description of the game. 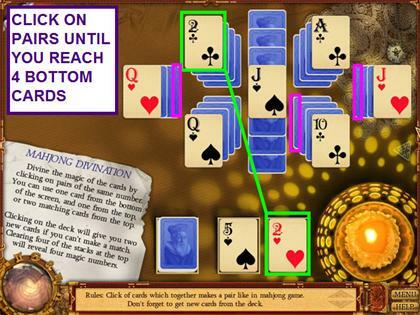 The object of this Mahjong style mini-game is to remove the cards from the tableau in pairs and access 4 of the base or bottom cards in a stack. When there are no more moves, click on the deck to deal to cards to the discard piles. The four numbers revealed are your fortune. 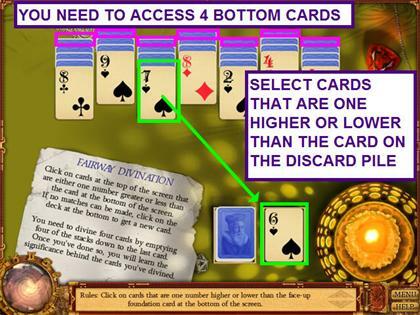 The object of this Fairway style mini-game is to remove the cards from the tableau and access 4 of the base or bottom cards in a stack. 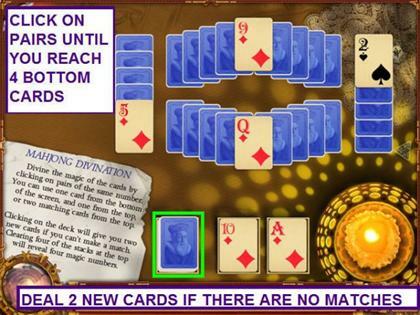 The card dealt from the reserve deck at the bottom determines which cards you can remove. You must take cards that are either one higher or one lower in number. When there are no more moves, click on the deck to deal another card. The four numbers reveal your fortune. 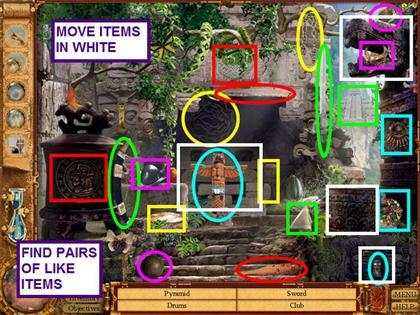 The object of this 2×2 mini-game is to make pairs until all the cards are used. Click on pairs of cards with the same suit until there are no more moves. The mini-games button the on the lower right will access all the mini-games. 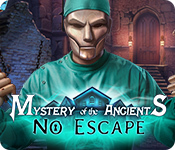 You may replay any mini-game that was completed in the game. 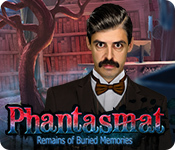 Click on the glowing question mark for the next step in your puzzle. 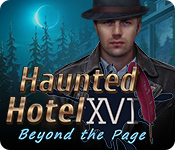 The journal pages give a synopsis of the past events. 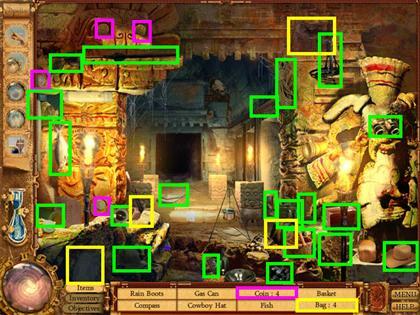 Elapsed time playing the game is shown in the upper right corner. 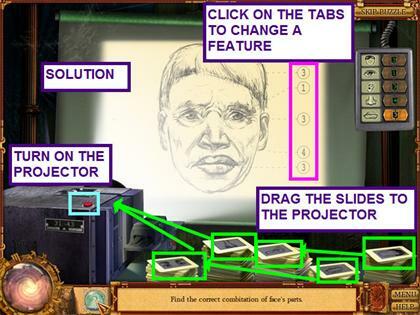 Click on “Resume Game” in the upper left to return to the game. 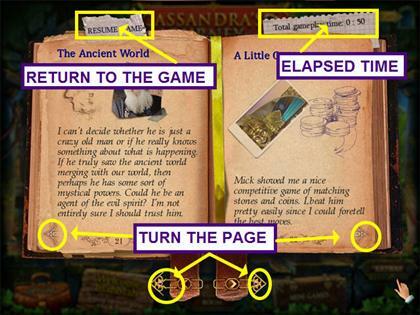 Turn the pages by clicking on the arrows. 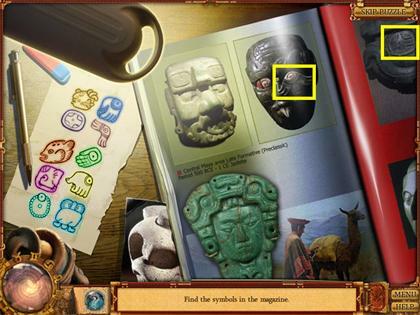 The hint system is on the left edge of the screen. Hints are unlimited, but you must wait for the hint to refill. 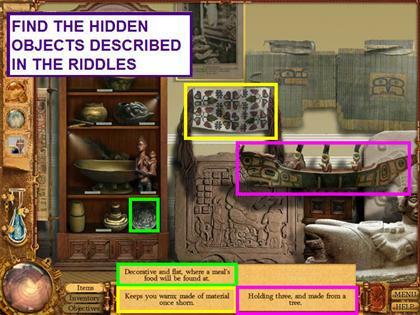 The lower container is the hint vessel where your hint is stored. 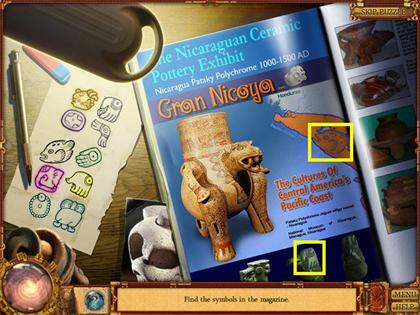 The 5 buttons above the vessel are the spells that use the contents of the hint vessel. 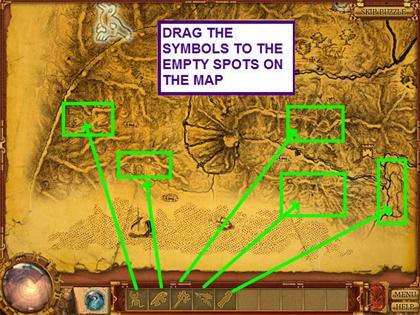 The pointer spell shows you a single object and uses 90% of the hint. 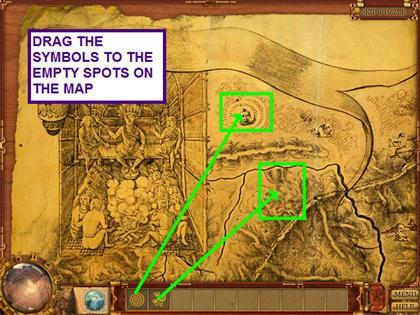 The area spell uses only 50% of the hint and shows you the general vicinity of an item. 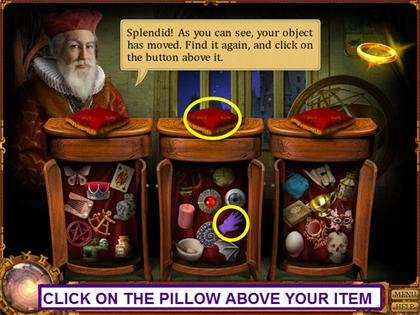 The magic wand spell uses 80% of the hint and turns the crystal ball into a compass that gets brighter as you near an item. 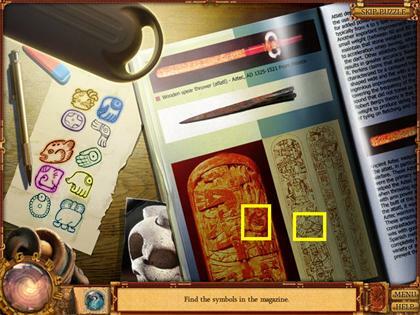 The object’s photo spell uses 70% of the hint and shows you a snap shot of the item. 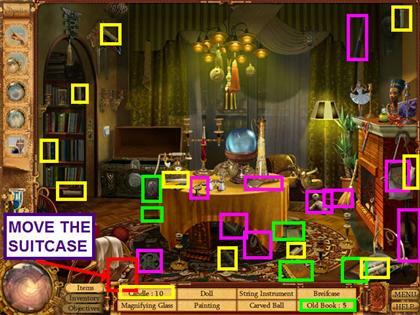 The slide show spell shows outlines of the active items in the crystal ball and costs 60% of the hint. Access the journal in the lower right corner. The “Help” button will trigger a mini-tutorial. 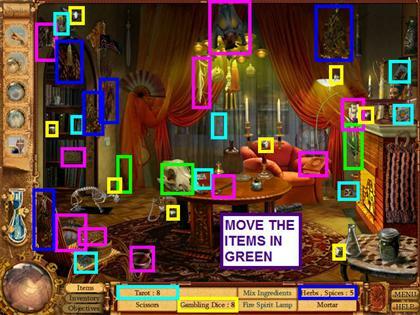 Hover your mouse over the crystal ball in the lower left corner to see the remaining number of items/tasks. 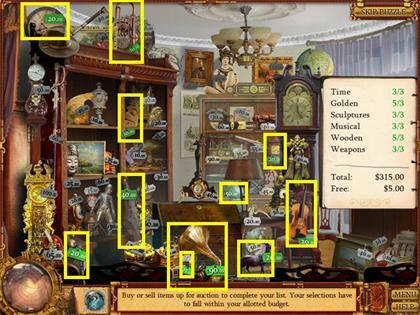 The items tab show the items/tasks required for this level. 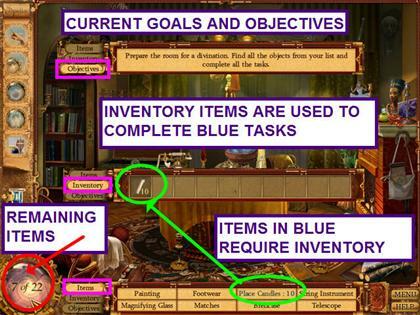 Items in blue require the use of an inventory item or an action. 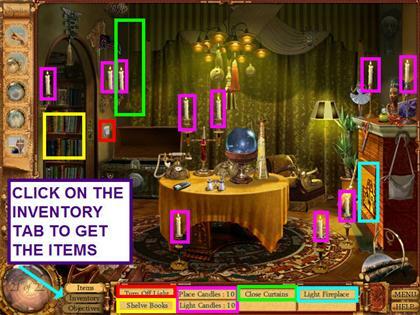 The inventory tab houses all the tools you have collected for a level. The objectives tab give the levels current goals. 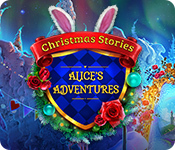 Now that Cassandra has her Grandmother’s ring, she can help Violet search for her brother. Take the key off of the center table. It will automatically go into your inventory. Take the key from your inventory and use it on the chest. 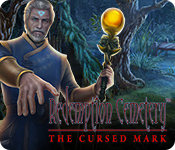 Take the crystal ball from the chest. Place the crystal ball on the stand. 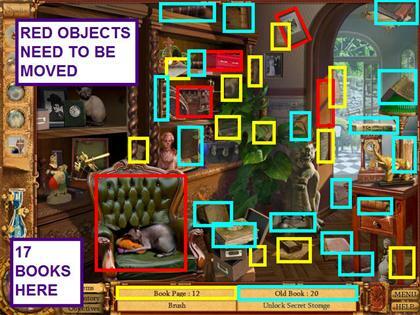 Locate all the hidden objects on the list. 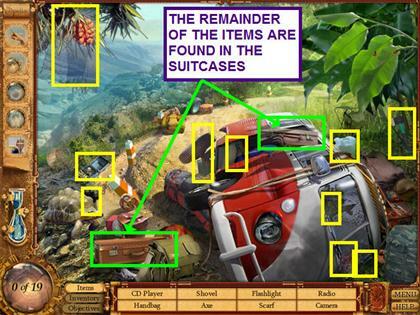 You will need to move the suitcase to find one object. Place the books on the shelf. Place the 10 candles in the 10 candlesticks. Use the matches to light the 10 candles. Use the matches to light the fireplace. Click on the cord to close the curtains. Click on the light switch to turn off the light. 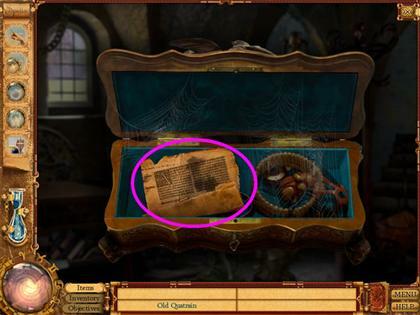 The object of this mini-game is to help Cassandra reveal what is in the crystal ball. 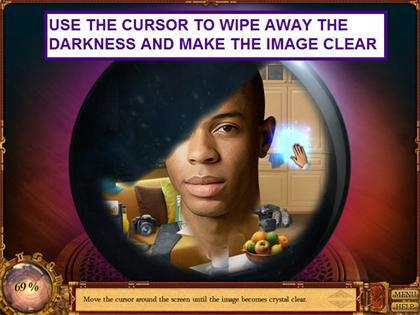 Use the cursor to wipe away the darkness until the image is clear. The evil spirit that came through the crystal ball knocks you unconscious and sends you to Nostradamus. 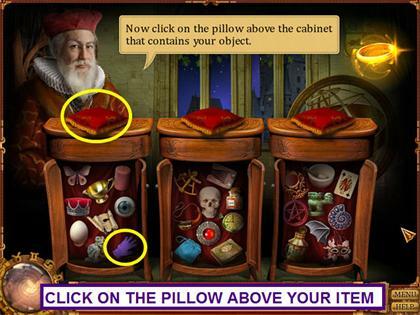 Choose any item in any cabinet and click on the pillow over that item. 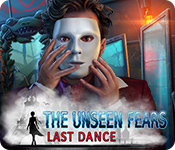 For this walkthrough, we have chosen the purple glove. Click on the left pillow. The purple glove has moved to the center cabinet. Click on the center pillow. The purple glove has remained in the center cabinet. 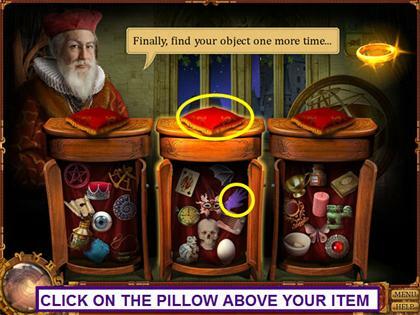 Through the power of numbers, Nostradamus has divined that our item is the purple glove. Click on the purple glove. You will need to open 3 cabinet doors, a drawer and the refrigerator. 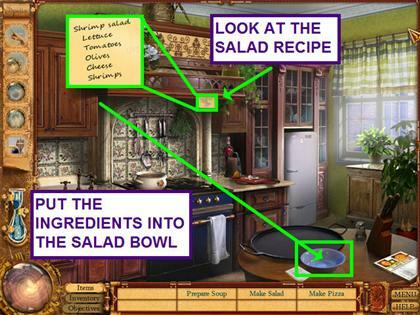 Look at the salad recipe hanging over the stove. Place the salad ingredients (lettuce, tomatoes, olives, cheese and shrimp) into the salad bowl. 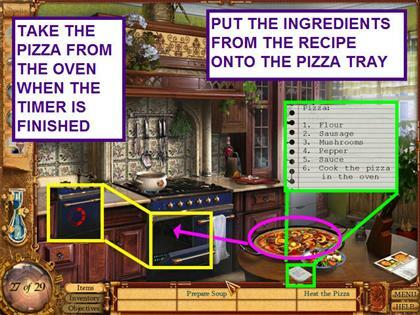 Look at the pizza recipe on the lower left of the table. Place the ingredients (flour, sauce, mushroom, sausage, and peppers) onto the pizza pan. Open the open and place the pizza inside. Close the pizza door. A timer will appear. When the pizza is finished cooking, take it from the oven. Look at the pumpkin soup recipe on the lower right of the table. Turn on the water in the sink. Wash the potatoes in the sink. Place the ingredients (pumpkin, onions and potatoes) into the soup tureen on the stove. 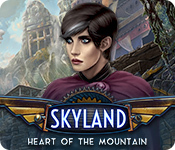 Now that Cassandra has eaten, lets try some solitaire divination. The four numbers reveal Michael’s address. You will need to open the two left cabinet doors. The cap, notepad, football, mat, and bowl of fruit will need to be moved. Take the remote and use it on the DVD player. 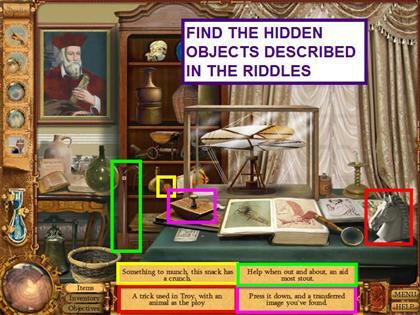 Find all the hidden objects on the list. 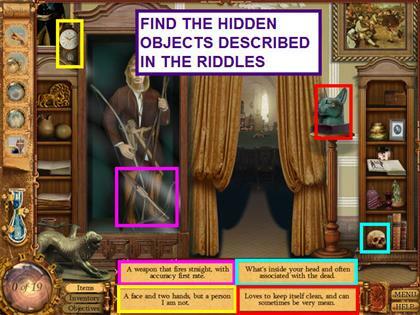 Locate the map in the large cabinet. 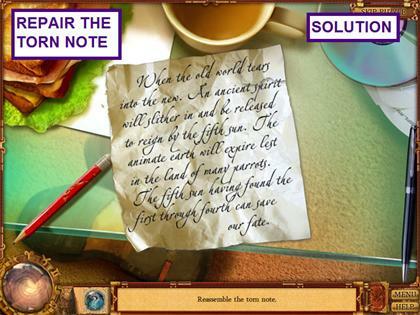 The object of this jigsaw-style mini-game is to repair the torn note. Left-click and drag pieces of the note into position. Adjacent pieces will lock together. Click on the “Continue” button in the upper right corner. 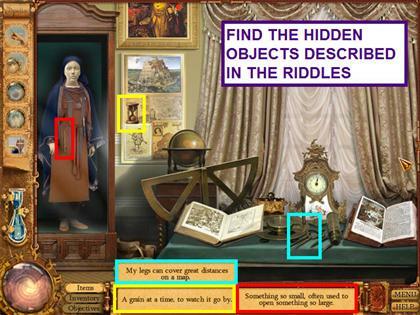 Find related pairs in this hidden object scene. Click on the two similar items. 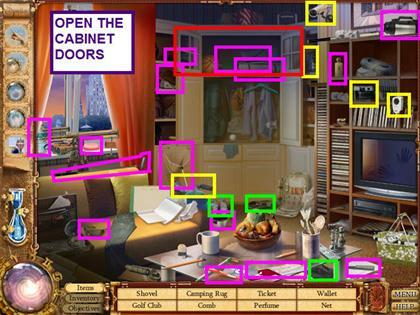 Click on the square cabinet door, low center screen. Take the box from the sparkling area. Take the old quatrain from the box. 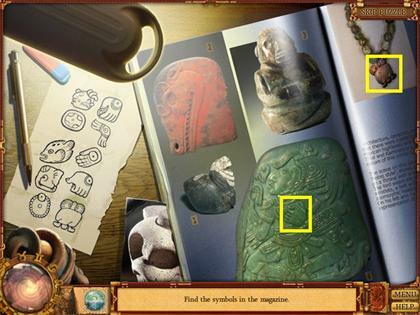 The object of this mini-game is for find the words from the left paper on the the right book. Click on each word as you find it. After you have found 22 matches, the text on the right will change. Find the remainder of the words in the left book. The four numbers revealed are very close to Cassandra’s address. 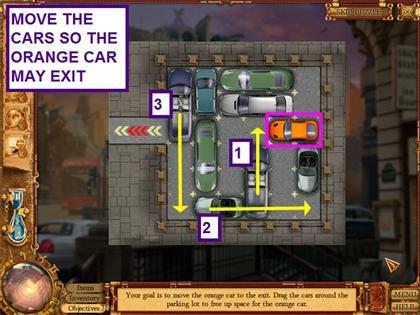 This scene has two mini-games that are found by clicking on the bus and the car. 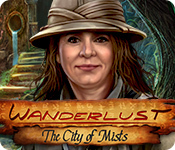 Click on the bus to trigger a mini-game. 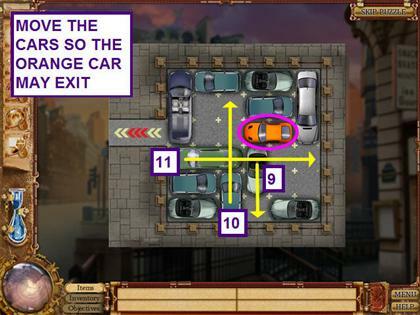 The object of this slider mini-game is to move the vehicles so that the orange car may exit. 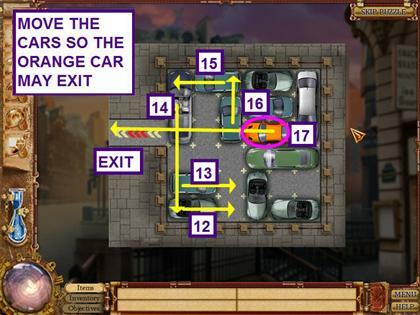 Click and drag a vehicle to change its position. 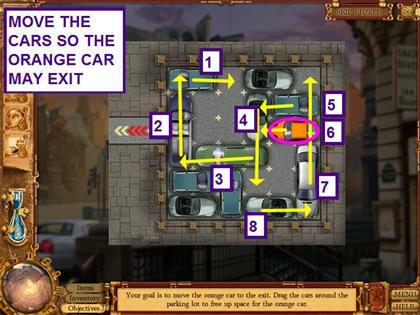 Click on the car to trigger a mini-game. 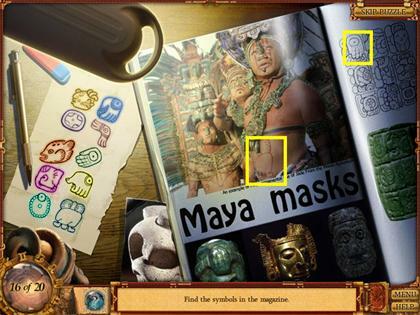 Locate all the Mayan symbols. 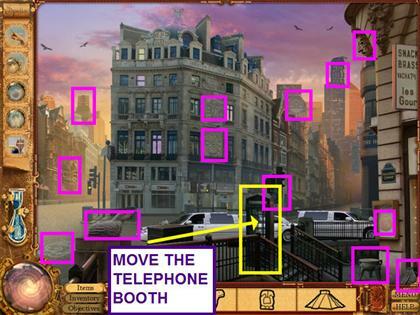 Move the telephone booth to reveal one of the symbols. You meet a crazy old man who says he is a descendant of Nostradamus. The crazy man challenges you to a match 3 game. Swap tiles to make matches of 3 or more. Make as many matches with the coins as you can. Matches of 4 or more will give you an extra turn. 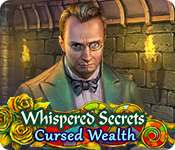 Beat the crazy man by having your meter fill up first with matches of the coins. 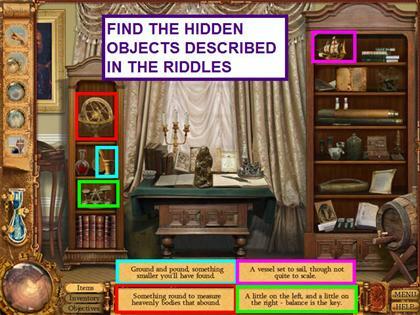 Find the hidden objects described in the riddles. 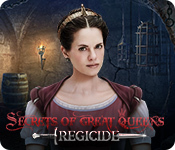 There are 3-4 riddles per scene. 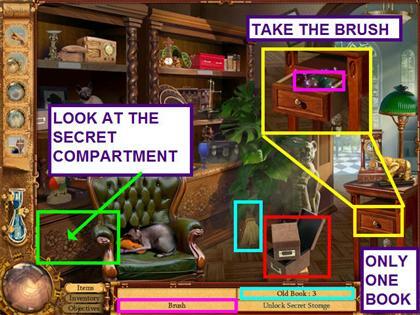 You will need to move the chair, red box, photo, secret compartment and case. Only 17 of the 20 books are visible. Move the stack of file boxes and take the book. Open the drawer and take the duster. Look at the secret compartment. 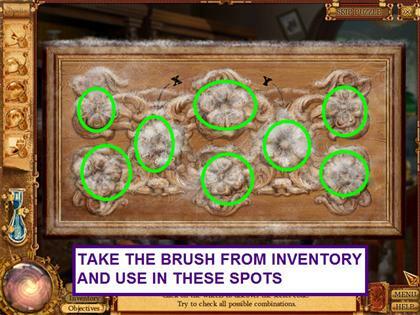 Take the brush from inventory and use it on the eight spots with cobwebs. 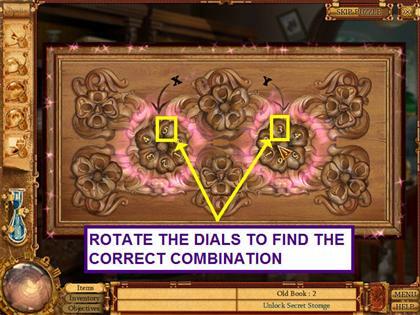 Determine the correct combination to open the secret compartment. Click on the dials to change the number. The combination is: (5, 3). Use the brush on the shelves with cobwebs. Take the final two books. 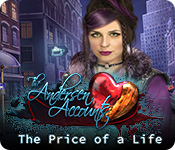 The object of this auction mini-game is to purchase enough items to meet the category criteria while staying in budget. Hover your mouse over an item to see in what categories and item is included. 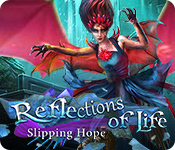 Click on an item to purchase, click again to remove it from your list. Items with green price tags have been purchased. 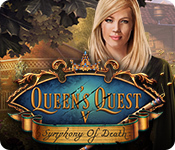 There are only three items that fit the music category, so purchase the Victrola, violin and the tuba. You may have more than the required amount per category provided you do not go over budget. 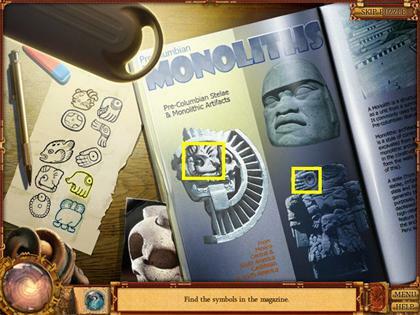 Locate the Mayan symbols on the magazine pages. 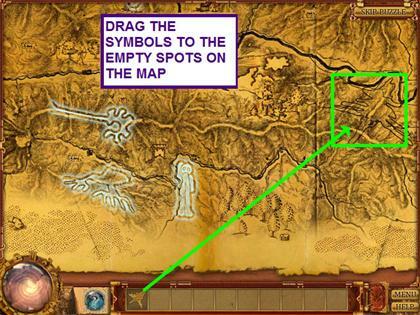 There are two symbols per page, on ten pages. 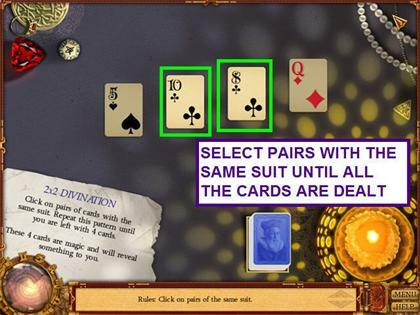 Click on pairs of cards with the same suit. The four numbers revealed are same as the auction paddle number of Mrs. Cutsworth. 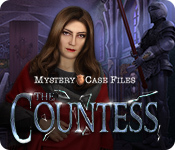 Mrs. Cutsworth is refusing to cooperate in your investigation. 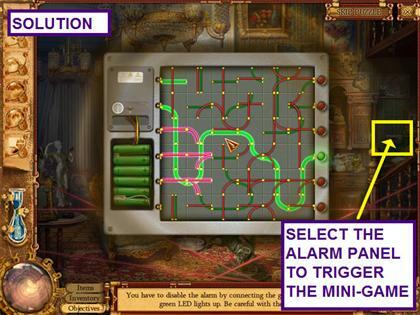 Click on the blinking alarm panel on the right to trigger a mini-game. The object of this alarm puzzle is to light up the green LED light without lighting up a red one. Click on a square to rotate it into position. 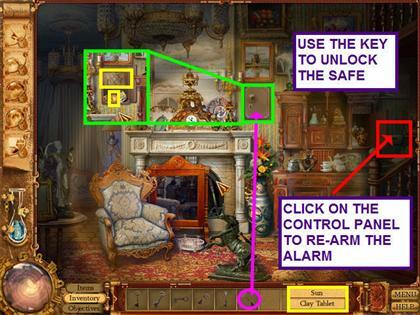 Click on the painting to the right of the fireplace to find the safe. Try all the keys until you find the one that opens the safe. Take the stone tablet and sun out of the safe. Click on the alarm control panel to reset the alarm. 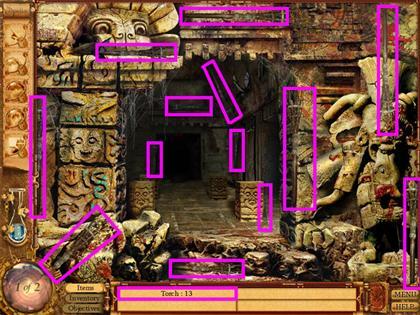 The object of this jigsaw-style mini-game is to repair the stone tablet. 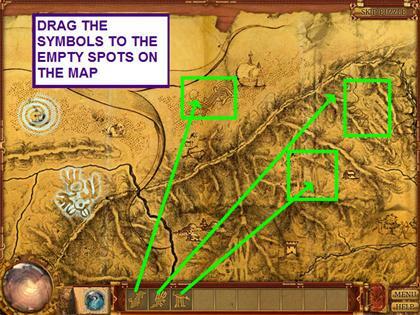 Click and drag pieces into place to complete the picture. Find the differences between the tablet and the printing press. Swap the letters in the grid to make the paper print correctly. Press the print button to test at any time. When you have correctly sorted a word, you will hear a flourish. 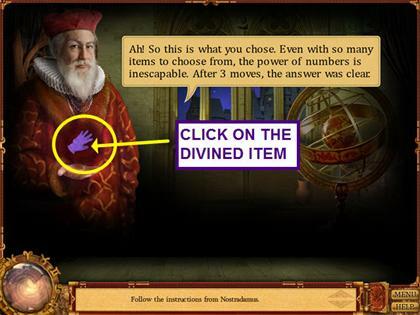 Nostradamus teaches you a trick with numbers in this mini-game. 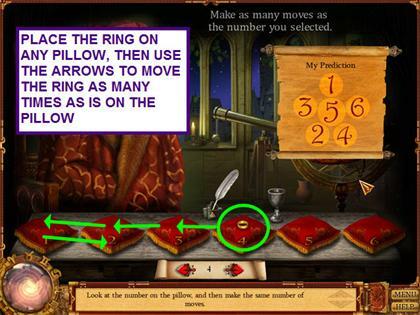 Place the ring on any pillow and move the ring the number of times that is on the pillow. The ring will never end up on pillow #1 no matter what pillow you start with. Make a series of moves to have the ring end up on pillow #5. The ring will always end up on pillow #5. You will need to move the violin, steer skull and plant. Add all the ingredients to the glass container. 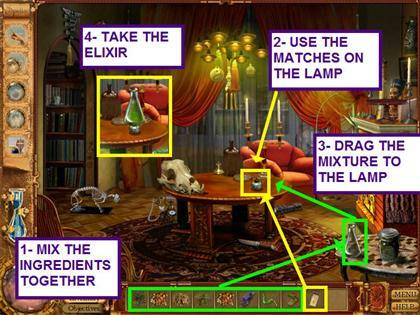 Use the matches to light the spirit lamp on the center table. Drag the mixture to the lamp. The four numbers reveal Mrs. Cutsworth’s address. 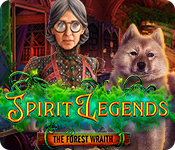 Mrs Cutsworth has been trying to protect Michael since she freed the evil spirit. The crazy descendant of Nostradamus challenges you to a match three game. 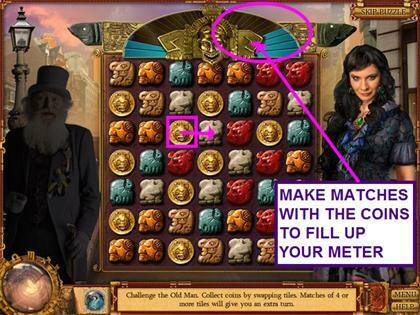 Beat the old man by having your meter fill up first with matches of the coins. 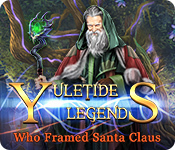 The old man gives you a magic looking glass. 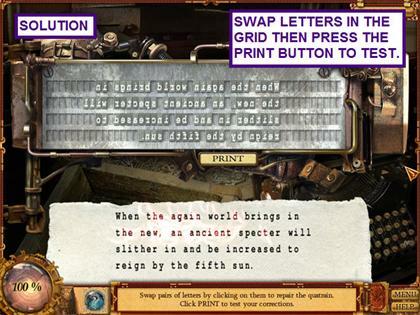 This mini-game is similar to the Magic eye puzzles. Stare at the red dot in the center of the image for 10 seconds. Click on the red button to turn on the projector. Drag each of the 5 piles of slides to the projector. 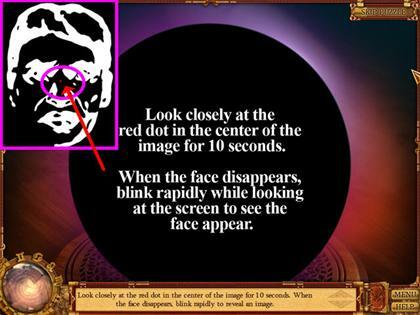 Click on the tabs to recreate the face you saw in the upper right corner. 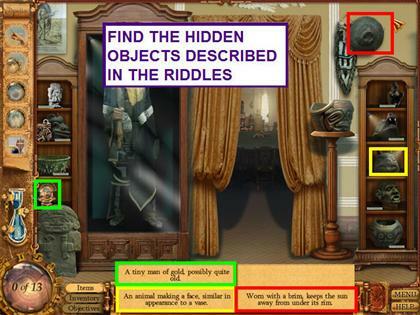 You will need to find pairs of items in this hidden object scene. Move the two chairs, love seat and the oval wall plaque to find items. 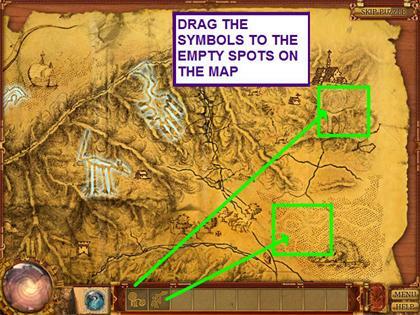 Drag the contour elements onto the map. 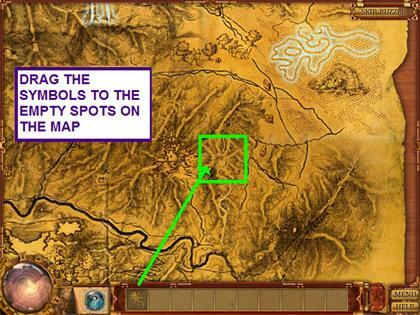 The game will automatically move you around the map. 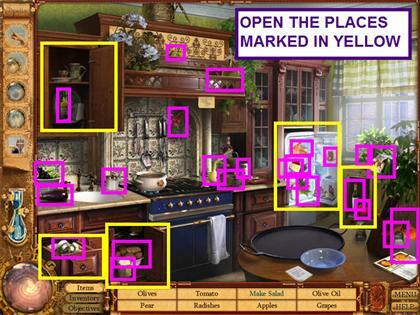 You will need to open the cabinet doors. Use the soap, then the water so you can take the jeans. Use the net on the boxes on the top shelf to find the bicycle helmet. You meet a native man who knows your name. 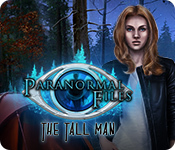 The native man challenges you to a match 3 game. 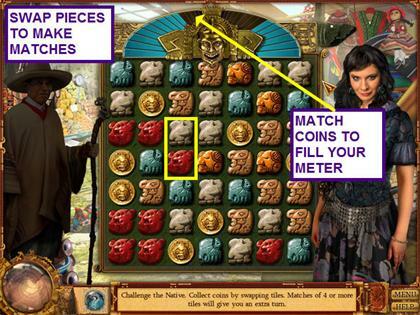 Beat the native man by having your meter fill up first with matches of the coins. 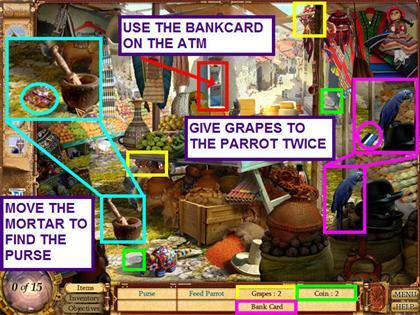 Find the two bunches of grapes and feed both to the parrot. Take the bank card that the parrot was hiding and use it on the ATM. Move the mortar to find the purse. 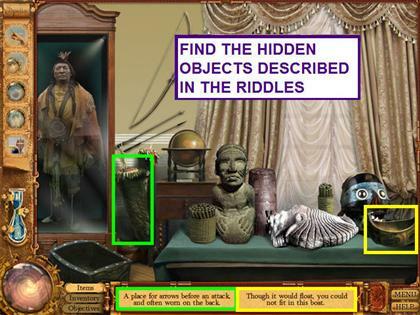 Drag coins to purchase the object in this hidden object screen. 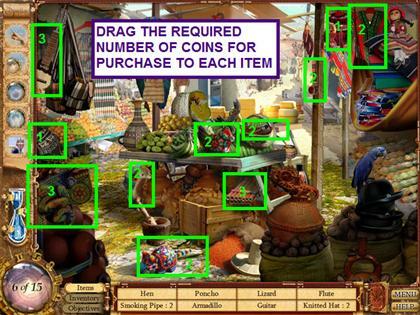 For items costing 3 coins, you will have to drag the coins and click 3 times on the item. 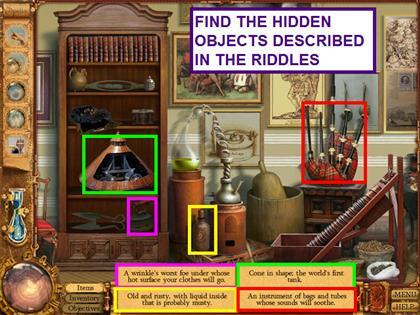 Find pairs of similar items in this hidden object scene. 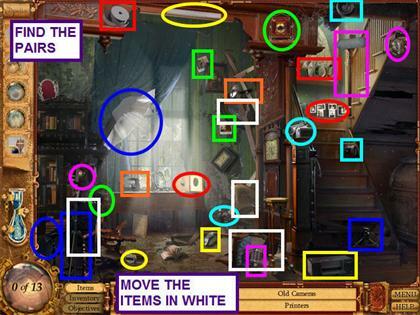 You will need to move the items marked in white. Remove matching pairs of tiles in this Mahjong tile game. You will need to complete three different layouts. 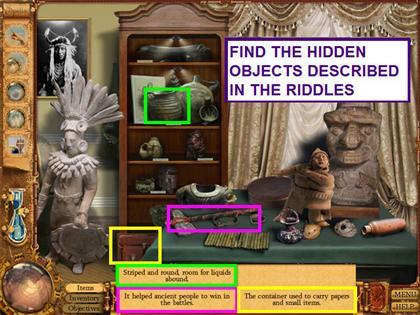 Find all the objects in the hidden objects list. 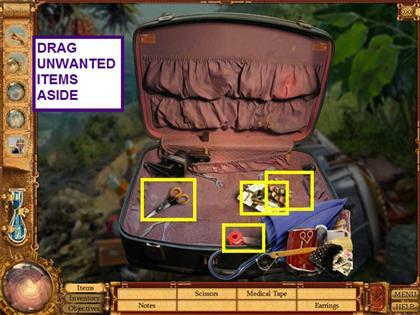 Some items are located inside the two suitcases. Select a suitcase for a close-up view. 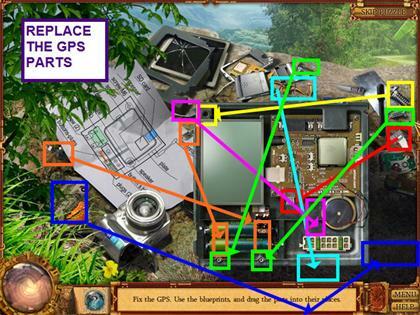 Repair the GPS by following the diagram on the left. Drag parts to the correct location. 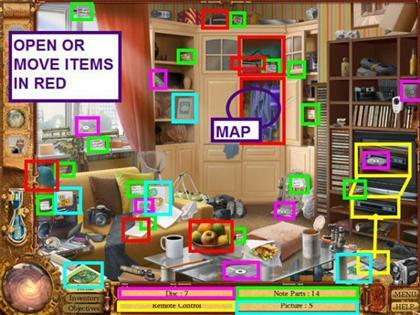 The game will tell you if you need to place another item first. 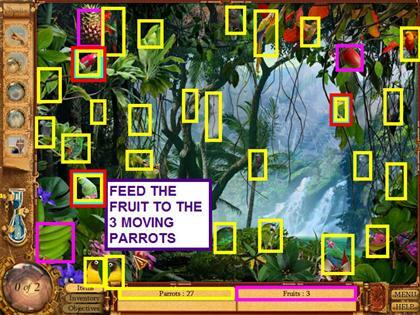 Collect the 3 pieces of fruit and feed them to the 3 moving parrots. Pick any of the parrots and click on the rock at the base of the tree it is perched on. The parrots will shuffle and land on different trees. Find your parrot and click on the rock at the base of the tree it is perched on. The parrots will shuffle and land on different trees for a second time. Click on your parrot to end the mini-game. Find the machete and use it to clear away the shrubs. 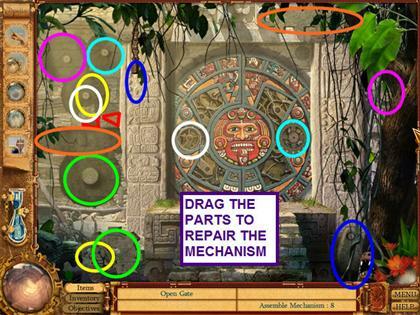 Locate the missing mechanism parts and drag them into place. 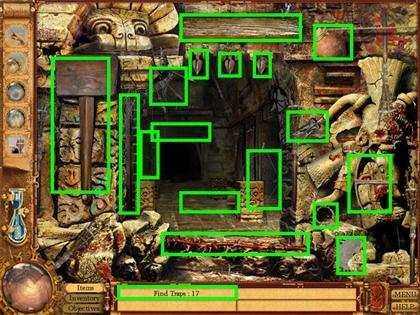 The object of this mini-game is to traverse the maze. Click on where you want to walk. 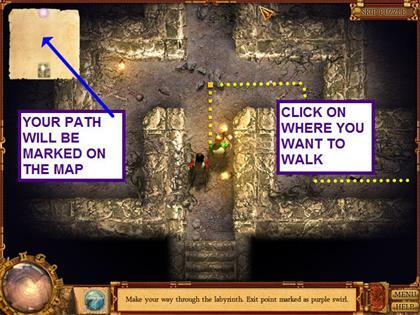 Your path will be noted in the the map in the upper left corner. 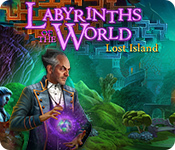 The end of the maze is marked by a purple swirl. 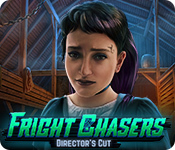 The most direct path through the maze is: up, right, down, right, up, left, down, left, up, left, up left, left, up, right, up, right, and up to the exit. Move in the given direction until there is another option. Find the 17 traps in the scene. Locate all the torches in the scene. 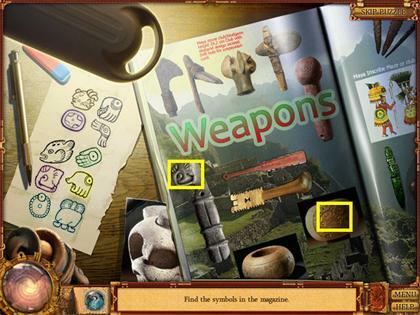 The object of this mini-game is to swap the torches so that each stone is lit by 2 torches. Note the different radius of light each torch has. Make the following swaps: (1,11), (4,5). (6,8), (8, 9). 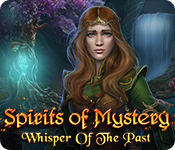 The spirits will interrupt your search. Once they are finished, you can find the remaining items. 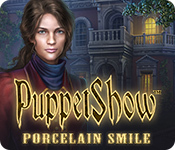 The object of this mini-game is to swap the tiles and recreate the carving. 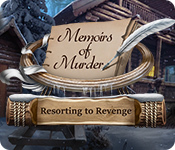 Left-click on two pieces to swap. You must press on the colors in the correct order to open the portal. Correct stones will stay lit, but all will go out if the wrong one is pushed. Starting at the top and going clockwise, number the stones 1-6. 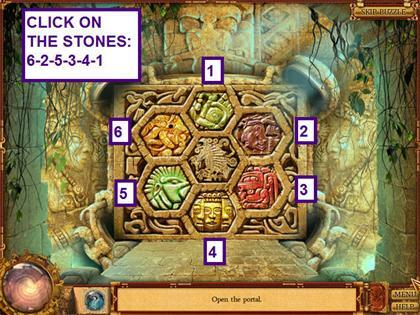 Press the stones in the order: 6-2-5-3-4-1. 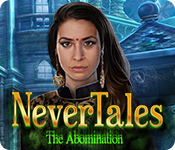 You have just completed Cassandra’s Journey 2: The Fifth Sun of Nostradamus!